New Horizons Village was developed in 1986 as the culmination of a dream, originally conceived in 1955. The Village is a 68 unit apartment complex, offering adults with physical disabilities the opportunity for self-directed living. Tenants manage their own lives in a supportive and fully accessible environment, with gently sloping pathways connecting all destinations, affording great levels of independence. The atmosphere of independence and accessibility at the Village, combined with support services empowers tenants to lead an enriching life. It was this independence and positive empowerment that was particularly notable when we conducted a strategic review, and it is what persuaded us of the need to project the reality of the Village in the 21st century. 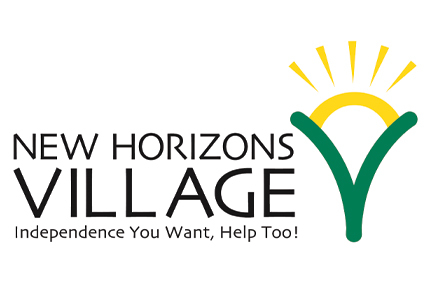 We commissioned Morgan Marketing Consultancy to develop a marketing plan starting with a new identity for New Horizons Village, keeping the essence of the Village personality, while modernizing the look and highlighting our core positioning. The property is nestled on 26 picturesque acres in a quiet residential neighborhood in the Farmington Valley. Uniquely, New Horizons Village combines barrier-free housing with non-medical care and transport support services subsidized by a financial assistance program for qualified tenants. Many residents work, volunteer and go to college, some for the first time in their lives. Others have used the Village as a stepping stone before moving into their own apartments in the general community. Most live here for a lifetime. Our new identity reflects the origins of the Village in breaking through new horizons, while equally showing we are a modern institution meeting the needs of today’s community. Our tagline “Independence You Want, Help Too!” truly gets to the heart of our community’s philosophy.